Get free pie, free kids meals, half-price wine and other deals with the Daily Dish menu at Marie Callender’s. Thursday: $9.99 for an Original Burger and slice of pie. Friday: $9.99 for seafood specials. Sunday: Half Price appetizers all day. Marie Callender’s also has a new Value Meals menu with $6 to $9 meals, good all day, every day. $9 Fish and Shrimp Plate, Open-Faced Turkey Sandwich, Quiche and Salad Combo, or BLTA Sandwich. 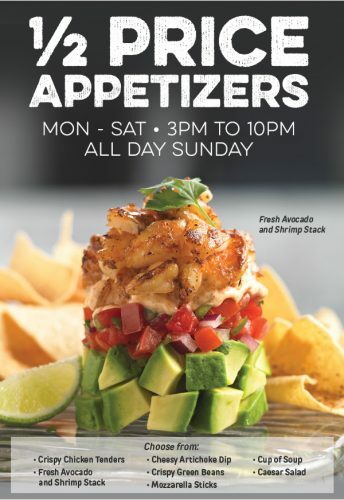 Also at Marie Callender’s, get half price appetizers during their happy hour, all day Sundays Mondays – Saturdays 3PM TO 10PM. Price and participation may vary per location.